I know I was supposed to come back and tell you more about my wonderful memories of summers with G&G, but well…it’s not quite later enough yet. This entry was posted in Adventures, Critters, It's all about me!, It's all Relative, Mimi. Bookmark the permalink. Mimi did a good job. Enjoy the rest of your visit. I hope you have a wonderful trip! Mimi is too sweet! I chased some halfway around the pond a few weeks ago. I guess I don’t tiptoe near as good as I use to. Have a nice rest of your trip! It’s time to move on little girl! You know that we love you and will be back in a year or two. Mimi did take a good picture of the ducks! I guess I should have went down there and got my share of the pictures! Oh, what a great picture of duck babbies. 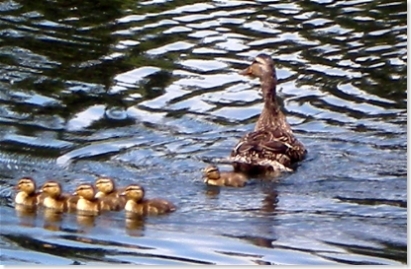 The baby duckies are going the wrong way! Hold on. I’m in the process of inventing an Incredible Shrinking Ray. I just need to test it out on my cats a few dozen times. What a great picture! Well done, Mimi! !